Lincolnshire CCC have moved to within seven points of retaining their Unicorns Eastern Division title following victory over Northumberland. They now sit 18 points clear of second-placed Staffordshire ahead of their final match against Hertfordshire, which begins on August 13. In Newcastle, Lincs won by an innings and 31 runs to take maximum 24 points. Lincolnshire recalled Louis Kimber and Conrad Louth returned for his first game of the season, replacing the unavailable Sam Wood and Matt Carter. On winning the toss, Lincolnshire elected to bat first and Kimber and Dan Freeman put on 60 for the first wicket before the former was trapped lbw for 27. Matt Lineker then joined Freeman in a stand of 106 before Freeman fell for a fine 82. Conrad Louth then joined Lineker in a stand of 93 before Louth was dismissed for 49. These two stands had given Lincolnshire the foundations for a huge first innings total. This appeared to have been thwarted, however, when the innings collapsed somewhat from 259 for 3 to 314 for 8, Lineker’s fine 107 being the backbone of the Lincolnshire innings at this stage. At this point the prospect of maximum batting points was in some doubt. After the tea interval the match swung dramatically in Lincolnshire’s favour. In less than 10 overs Ross Dixon and Alex Willerton added 107 for the ninth wicket, Dixon hitting 12 fours and four sixes in a superb 84 not out, Lincolnshire being finally all out for 421 with maximum batting points secured. Northumberland’s innings collapsed dramatically and by close of play on day one they had slumped to 61 for 6, Andy Carter, Dominic Brown, Alex Willerton and Dan Freeman all taking wickets. On the morning of day two Lincolnshire pressed home their advantage and quickly dismissed the hosts for 93, Andy Carter with 3 for 28 being the chief wicket taker. Lincolnshire, leading by 328, enforced the follow-on. Northumberland again lost an early wicket but showed significant resistance. 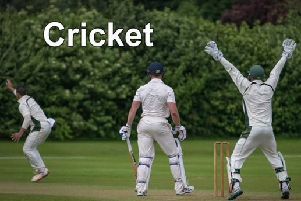 James Thompson (38) and Alex Simpson (42) added 70 for their second wicket and Jacques du Toit (76) and Jack Jessop (23) put on 65 for the fourth wicket, before Dominic Brown secured the vital wicket of du Toit. Sean Tindale, Bradley Yates and Oliver McGee added useful scores, but this was all to no avail as shortly before 5.30pm the hosts were all out for 297. Andy Carter with 4 for 54 again being Lincolnshire’s most successful bowler. Lincolnshire won by an innings and 31 runs taking a maximum 24 points from the match with Northumberland taking four points. Lincolnshire’s final three-day fixture is at Cleethorpes commencing on Sunday, August 13. The home county need seven points from that fixture to win the Eastern Division for the second successive season.